Viaje para o coração da cidade e hospede-se diretamente no Park Hyatt Nova York. Design inovador, suítes e quartos de hóspedes enormes e a bela vista do Central Park e do horizonte de New York fazem com que este seja, definitivamente, "o lugar para estar". 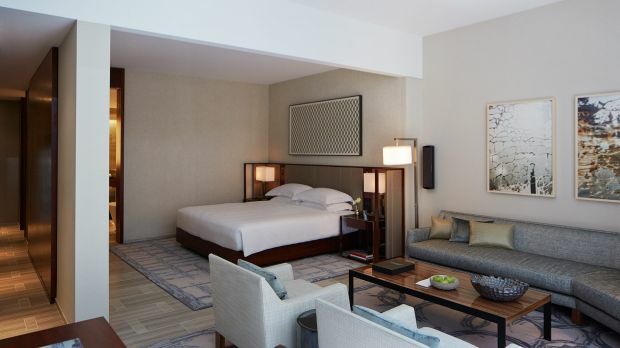 Enviar solicitação de disponibilidade com as datas desejadas para Park Hyatt New York. Features 1 King bed and spa-inspired bathroom. Located on floors 8-16. Features 2 Double beds, tub, roll-in shower and spa-inspired five fixture bath. Features 1 King bed and spa-inspired five fixture bathroom. Located on floors 12-23. Features 2 Double beds and spa-inspired five fixture bathroom. Located on floors 12-23. Features 1 King bed, large living room and spa-inspired five fixture bathroom. Located on floors 8-10. Features 1 King bed, large living room and a spa inspired 5-fixture bath. Located on floors 8-10. Features 1 King bed, sitting area and spa-inspired five fixture bathroom. Located on floors 8-10. Features 1 King bed, location on floors 8-10, sitting area and spa-inspired five fixture bathroom. Features 2 Double beds, sitting area and spa-inspired five fixture bathroom. Located on floors 8-15. Features 1 King bed, separate living room, 1.5 bathrooms and spa-inspired five fixture bathroom. Features 1 King bed, panoramic views and 1.5 bathrooms with a spa-inspired five-fixture bath. Features 1 King bed, large living room and spa-inspired five-fixture bathroom. Located on floors 17-21. Features 1 King bed, furnished terrace and 1.5 bathrooms. Features 1 King bed, large furnished terrace and 1.5 bathrooms with spa-inspired five-fixture bath. Features 1 King bed, large furnished terrace and 1.5 bathrooms including one with a spa-inspired five-fixture set. Features 1 King bed and a sitting area. Located on floors 22-23.